Defence Minister Manohar Parrikar on Saturday said anyone speaking against the country must be “taught a lesson” in the same way that an “actor” and an “online trading company” were taught. Parrikar took no names. But in November 2015, at the Ramnath Goenka Awards, actor Aamir Khan had spoken about a “sense of insecurity” resulting from increasing intolerance in the country, and mentioned his wife Kiran Rao’s apprehensions about the future of their child in India. A few months later, e-commerce giant Snapdeal, for which Khan was brand ambassador, did not renew his contract. Snapdeal had earlier faced a strong backlash on social media, including a reported loss of customers. “I am only trying to point out… if anyone speaks like this, he has to be taught a lesson of his life,” Parrikar said at a ceremony to launch the Marathi edition of a book by journalist Nitin Gokhale. “Actorne jeva hey kela, thehva jya company la toh advertise karat hota… online trading company hoti. Aple log thoda jaste hoshar ahet. Mala mahite ahey there was a team which was working on this… They were telling people you order and return it… The company should learn a lesson, they had to pull out his advertisement… (When the actor did this… then the company which he was endorsing was… an online trading company. Some of our people are very smart, I know. There was a team which was working on this. 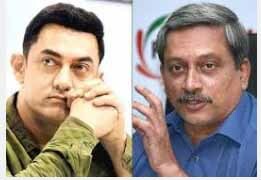 They were telling people you order and return it… The company should learn a lesson, they had to pull his advertisement),” Parrikar said. Khan’s statement was very “arrogant”, the minister said. At a time when a debate is raging over the alleged use of disproportionate force by security forces in Jammu & Kashmir, Parrikar also argued strongly for the use of “full power” by the Army in counter-insurgency operations. “I do not want to train the Army to use the lathi,” he said. He added, however, that the decision to call in the Army was to be taken entirely by the civilian authorities. “Where to use the Army is a civilian decision. However, whenever the Army is used, full power has to be there, otherwise do not use the Army,” he said. The defence minister said that under no circumstances would the armed forces be asked to face a situation with one hand tied behind their backs. “We have to understand what is the importance of national security. This question has again come to the fore because of a recent judgment regarding Northeast,” he said. On July 8, the Supreme Court questioned the continued deployment of the Army in Manipur under protection of the Armed Forces (Special Powers) Act (AFSPA), saying this mocked India’s democratic process and symbolised the failure of both the civil administration and the armed forces. “I will be very happy if we do not have to use the Army anywhere in the country other than disaster management,” Parrikar said. The Army, he said, has never violated human rights, and has instead worked towards protecting them.